You think a hostal is a cheap hotel for students? Well, not if it is the Hostal Spa Empúries. 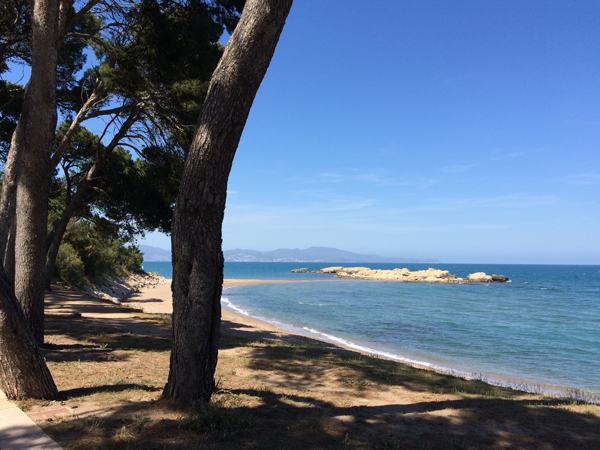 Located on the beach on the Costa Brava between l’Escala and Sant Martí d’Empúries, this 4-star accommodation boasts a gourmet restaurant and spa, next to some of the most important history in this history-laden region. With Girona’s Time of Flowers (Temps de Flors) [CLICK HERE] behind us and Elyn’s exhibit [CLICK HERE] taken down, we were in the mood for a complete change of scenery. Hostel Empúries was it. The tiny village of Sant Martí was probably the site of the earliest Greek town on the Iberian peninsula. Founded in the 9th century BCE, the town of Paliapolis, as it was known then, was a major urban center overlooking the port where Greek and, later, Roman ships carried on trade across the Mediterranean to Italy. 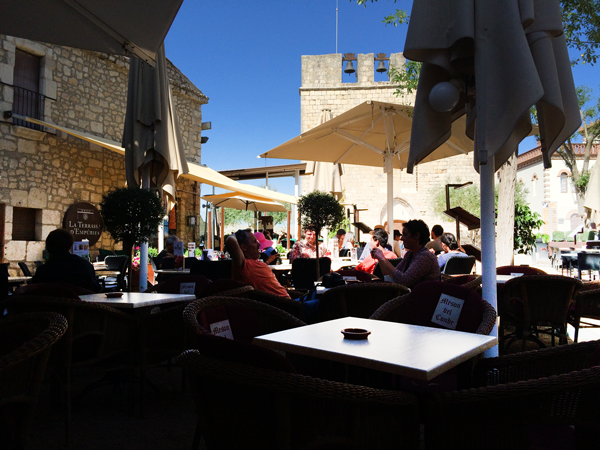 Now Sant Martí is a small village with a cluster of bars and restaurants around the square, and a few medieval buildings. 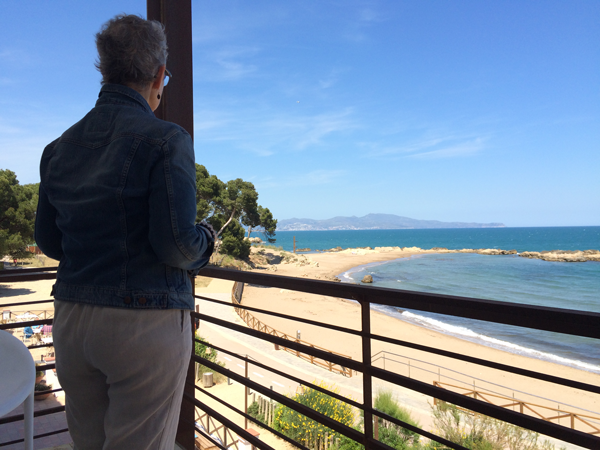 After checking into our hotel, we followed the boardwalk to Sant Martí along the forest path that would once have been the entrance to the port—now completely silted in. On the hillside to our left we could see the ancient Greek town of Empúries, which dates from 550 BCE and was known as Neapolis—the new city. This city and the Roman town higher up on the hill were long buried and nearly forgotten until the early 20th century. Archeologists began unearthing artifacts. and the dimensions of the two towns began to emerge. 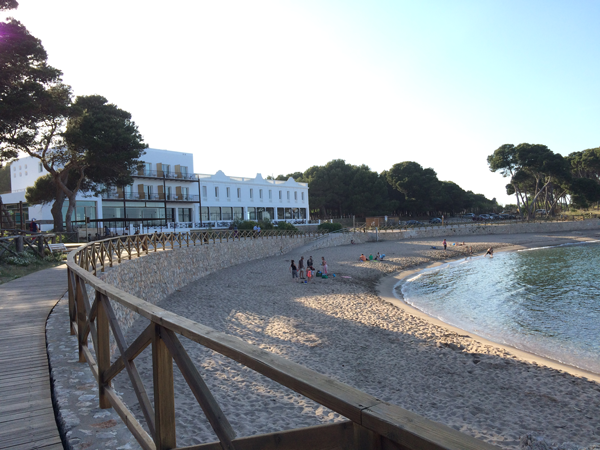 Hostel Empúries was built originally to house the scientists working on the project. Archeological work continues to this day, but enough of the ruins have been uncovered to make for an interesting visit, complete with a multi-lingual audio guide and an extensive museum. This is a region covered with layer upon layer of history. Even our hotel contains within it the remains of that early 20th-century hostel. Although it is now an eco-award-winning spa-hotel, the walls of the older section are filled with photographs of the archeologists at their work, and some of the early floors and woodwork have been maintained. 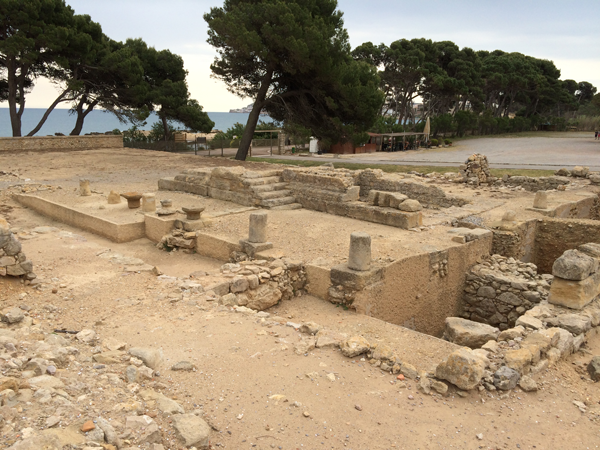 We explored the ruins of Empúries. Elyn wanted to see the healing sanctuary and statue of Asclepius (impossible to miss) and the Temple of Serapis and Isis. At the gift shop, she asked for information about the Temple of Serapis and the clerk searched in vain. Suddenly Elyn heard the voice on the audio guide. The machine had turned itself on to #4—The Temple of Serapis—and she was hearing a detailed description. She wondered if the Spirit of the Place was at work, giving her the information she was seeking. Still puzzling over this bizarre event, we checked out of the hotel and returned to Girona in time for our previously scheduled massages at an excellent holistic health center. Does all this make you hungry for an expat life? I promise to discuss the practicalities of doing just that in future posts.